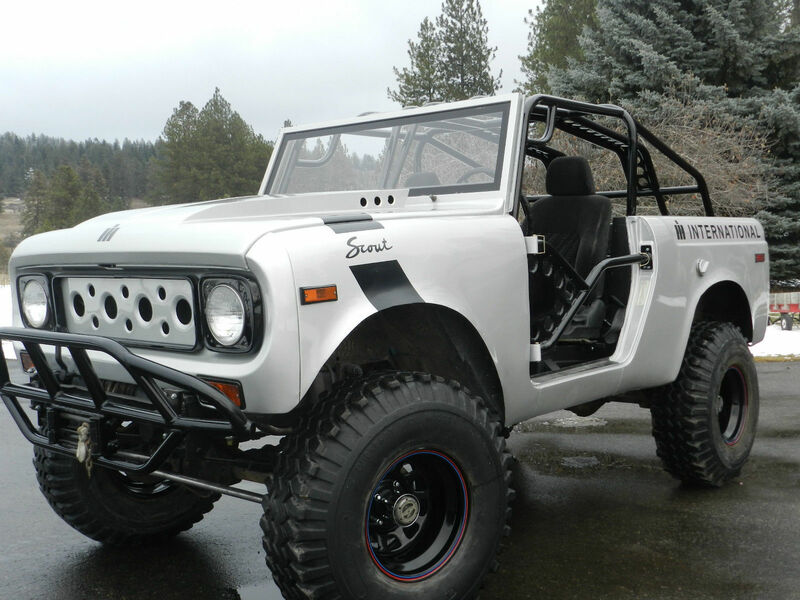 This 1971 International Harvester Scout 800 is described on ebay as a newly built, running, drivable project vehicle. It’s powered by a Ford 302 V-8 that runs through a 4-speed, manual transmission. From there the power is fed into Dana 44 axles. A new Holley carburetor can be found atop the 302. Up front there’s a working Ramsey PTO winch. The truck wears new paint and a custom rollcage and hood. A top is available. The seller states that there isn’t much in the way of an exhaust so it’s loud. With an unmuffled V-8 that might be an understatement. This truck is located in Chewelah, Washington. There are about 5 days left on the clock and bidding currently stands at $5,005 with an unmet reserve. I spotted this 1971 Land Rover Series IIA 88 Utility on ebay yesterday. The seller states that it was treated to a $50k, frame-off restoration in 2000 at the British Northwest Land Rover Company, and has taken four Best in Class awards since that time. Better-than-new upgrades include dual gas tanks, leather seats, stainless steel exhaust, and gearing to allow 70-mph highway cruising. 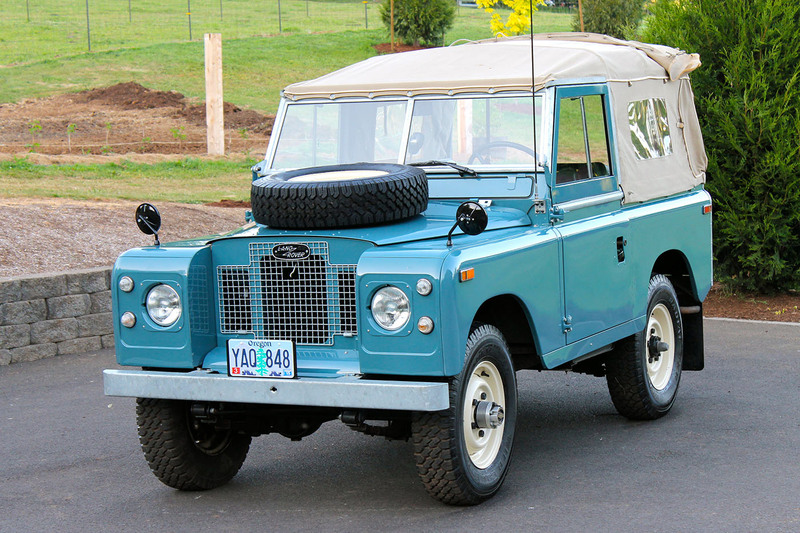 This classic, soft-top Land Rover was finished in marine blue and features a 2.25-liter, four-cylinder, gasoline engine. Total mileage is just over 51,000, with 4,000 having been driven since the restoration. The condition really does look fantastic. The vehicle is located in Lake Oswego, Oregon. Bidding currently stands at $14,600 with an unmet reserve. There are about eight days left on the auction. More photos below. 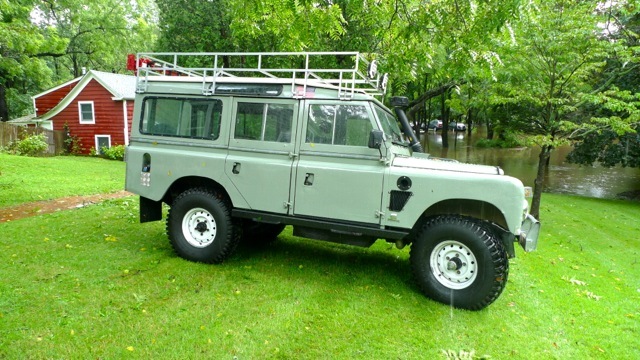 Update 5/19/2013: This Land Rover sold for a high bid of $34,250. Continuing on the Grand Wagoneer theme, here’s a dealer commercial for the 1973 Grand Wagoneer. The narrator enthusiastically states that the rear seat is standard, not an optional extra. It’s funny to look back at the history of the SUV. On this full-time 4-wheel-drive system, the lock-out for the center differential was in the glove box! This looks like quite a nice rarity, a fully restored 1971 Land Rover Series IIA 109, that’s been re-powered with an intercooled Cummins 4BT turbo diesel engine. 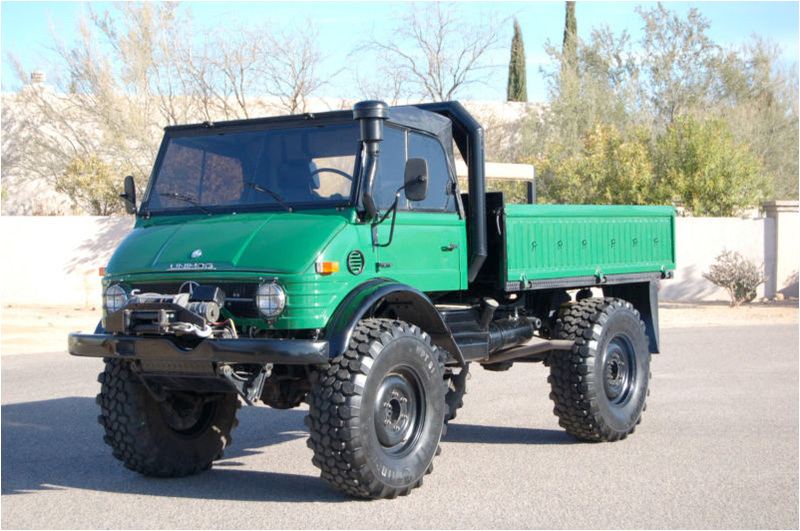 In addition to the roof rack, it’s fitted with a custom bumper, 8,000-lb Warn winch, and dual fuel tanks. From the sound of the ad and the look of the photos, this is a first-class truck. Can you imagine yourself sitting in that clean, purposeful interior as you rumble across the terrain? The seller is asking $31,000. More images below. The seller offers a full write-up on his blog. Here’s a video about a bunch of guys that in 1978–79 took six stock Jeeps from Cape Horn, at the tip of South America, to Prudhoe Bay, at the top of Alaska. They called their 21,000-mile, 120-day trip the Expedición de Las Américas. The video, which is actually really great, comes complete with tough-guy narration and a goofy, 70s soundtrack that extols the virtues of being guided by rainbows. As they leave South America, however, they’re in for some serious terrain. They must cross the Darien Gap, 200-miles of jungles and swamps that separate Central and South America. (Today it’s half as long.) One of their non-rainbow guides put it nicely: the Darien Gap is not something to be conquered but something to be experienced. I’m paraphrasing, but you get the idea. This video is also something to be experienced: almost half-an-hour of vintage, Camel Trophy-worthy expedition. I spotted this long-wheelbase, right-hand-drive, Nissan Patrol G60 on Bring a Trailer the other day. 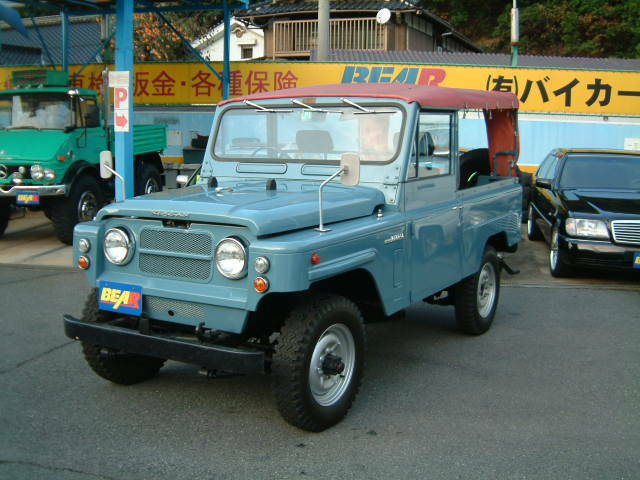 Here in the US, the Patrol always seemed (to me anyway) like the lost icon of Japanese four-wheel drive. I see them mentioned all the time. In fact, they can be found on any continent in the world — they love them in Australia — yet they were never shipped to North America. That goes for this one as well, by the way. It’s located in Hiroshima, Japan. Seeing as it’s over 25-years-old, however, feel free to bring it over. This particular model is from near the end of the second generation’s production cycle, which ran from 1960 to 1980. The styling is more quirky and less iconic than either the Land Cruiser or Land Rover (both of which it seems to imitate in equal measure). It has its own unique charm though. Check out the 3-wiper folding windscreen, the amazing color, and the skinny tires on steel wheels. I bet it would look even better without the weird, red top. Find it on Goo-net where the ad mentions that it’s “ordinary engined” and “commonly used.” Is that good? I’d ask. The mileage is listed as an astounding 10,000km (~6200 mi.). They’re asking US$22,400.